I'll get straight to the point. If Old Yeller doesn't make you tear up, you have no soul. Sure, it's the movie that became the template for every boy and his dog story to come out of Hollywood over the last 50 years--it's a cliche. 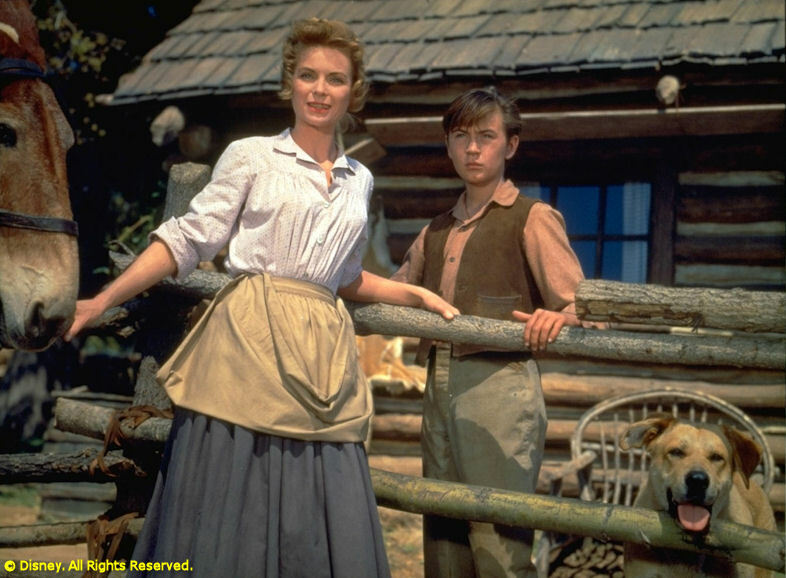 But, it's also one of Disney's most emotionally direct and honest live action films with a terrific performance by its young star Tommy Kirk. Old Yeller begins with Texas rancher Jim Coates (Fess Parker) joining a cattle drive for three months to earn money for his family. He leaves behind his wife Katie (Dorothy McGuire) and his two sons Travis (Kirk) and Arliss (Kevin Corcoran). Being the oldest, Travis becomes the man of the house and takes to his new role with the brashness and arrogance of a young'un that's more than a boy, but not quire a man. When a stray yellow dog wanders onto the homestead, Travis's first inclination is to run the mangy critter off. After all, the mutt steals food, upsets the livestock and generally busts up the property. Katie urges Travis to be patient, though. Old Yeller could turn out to be a good dog for young Arliss, and Travis could train him to be helpful around the ranch. It comes as no surprise, then, when Yeller shows his mettle, becomes a skilled ranch dog and protects both boys from the dangers of the wilderness. Travis and the dog inevitably bond and we get sucked right into the emotion of their relationship. So, when tragedy strikes <sniff> and Travis has to man-up to do what's right <sniffle>, there isn't a dry eye in the house. You're getting a little misty-eyed right now, aren't you? This is part four of my 30-day Disney movie challenge. Tomorrow, the story Disney got horribly wrong, they first got very right...and it's my favorite Disney action film.